Spacious one bedroom apartment with king size bed. Just metres from the beach. 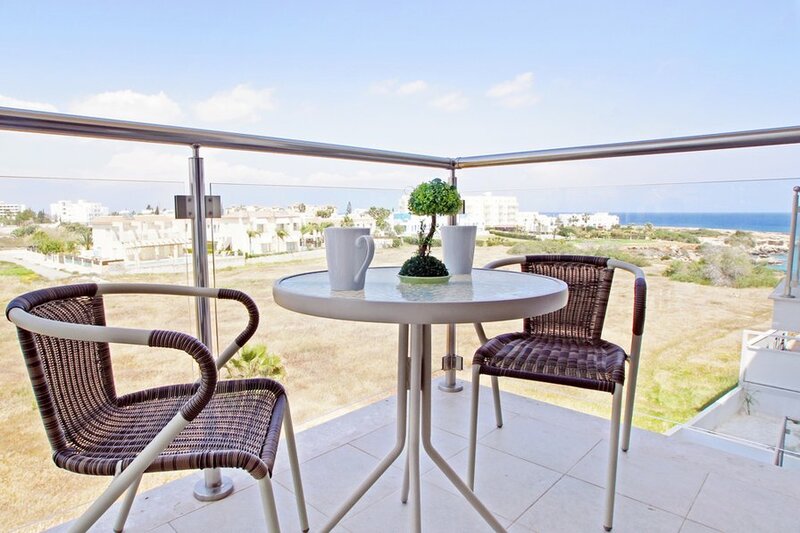 Beautifully furnished and with a balcony offering fabulous views. The apartment is furnished and equipped with all modern appliances such as flat TV, DVD player, microwave oven, full size refrigerator,dishwasher, washing machine, toaster, kettle, all necessary kitchenware and with access to shared pool. This is a spacious second floor one bedroom apartment with open plan setting with the kitchen, dining and lounge area well spaced out for maximum comfort. The lounge area is tastefully furnished with sofas, a coffee table, a flat TV/DVD player.The apartment has balcony with outdoor furniture and sea view. The dining area can seat up to 4 people comfortably. The kitchen is well equipped including oven/hob, fridge/freezer, and washing machine. Bedroom with inbuilt cupboard space with a king size bed. All are well designed to ensure best possible stay during your holiday. All necessary bed linen including bath towels are provided. Internet Access available at the restaurant near by. Book this apartment and be assured that this is going to be a holiday experience to remember. Welcome pack provided upon arrival. Additional camp bed, baby cot, high chair can be provided upon request. The Apartment provides a holiday experience to remember. It's relaxing atmosphere is all you ever dreamed of. With its beautiful clear sky-blue waters and sandy beaches Protaras has grown into one of the most popular family holiday resorts in Cyprus. Located about 10 km north east of Ayia Napa, it has expanded into a modern holiday resort of considerable size with many hotels and hundreds of holiday apartments and villas. Restaurants, pubs and other associated facilities are everywhere. Fig Tree Bay in Protaras with its clear turquoise sea and fine golden sand, understandably appeals to both visitors and locals alike. By day Protaras is a beach resort but comes alive after dark and offers a wide range of friendly restaurants, cozy taverns, bars with live entertainment and shopping opportunities to suit the whole family.